The Carpenter Pixie Walker Wagon from Haba encourages tots to push themselves up on their feet and start walking! Many authentic looking tools including a saw, hammer and wrench are included, so wee ones can hone their handy skills by ‘helping’ mom and dad with small fix-it repairs. 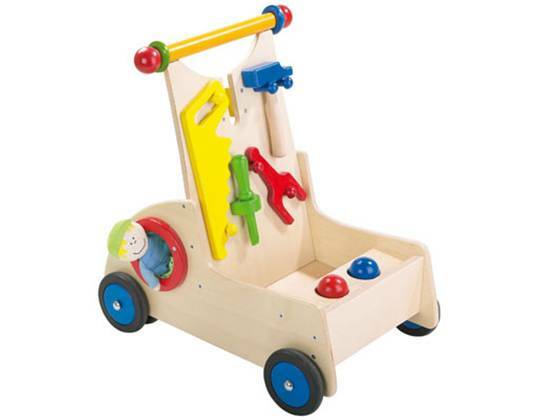 Made with eco-friendly birch wood, rubber wheels and child-safe, non-toxic finishes, this little walker wagon promotes fun pretend play, problem solving, matching and sorting and social play. This toy will also help build your baby’s build self-confidence in his own movement abilities and foster greater coordination. Recommended for babies and toddlers one-year and up, the walker includes an adaptable brake to ensure safety and success for new walkers. The Carpenter Pixie Walker Wagon from Haba encourages tots to push themselves up on their feet and start walking! Many authentic looking tools including a saw, hammer and wrench are included, so wee ones can hone their handy skills by 'helping' mom and dad with small fix-it repairs. Made with eco-friendly birch wood, rubber wheels and child-safe, non-toxic finishes, this little walker wagon promotes fun pretend play, problem solving, matching and sorting and social play. This toy will also help build your baby's build self-confidence in his own movement abilities and foster greater coordination. Recommended for babies and toddlers one-year and up, the walker includes an adaptable brake to ensure safety and success for new walkers.